Dr. Johnson attended Virginia Tech, where he received a Doctorate in Veterinary Medicine and a Masters of Science degree in Zoology. He attended the University of Virginia for for a Bachelor of Science degree in Biology. Dr. Johnson has been with the PetCentre family since 2005. He enjoys general surgery and internal medicine. Dr. Johnson supports a work-life balance and when he is not working with animals, he finds time for river kayaking, camping, music, gardening and volunteering. He is married and has 4 children, 3 grandchildren and 4 adopted pets....2 dogs and 2 cats. Dr. Acha attended Virgina Tech, where she received a Doctorate in Veterinary Medicine. She has been caring for PetCentre pets since 2005. Dr. Acha is passionate about healing and resolving pain in her patients. She is happy when the caretaker and patient are both happy. She enjoys travel and meeting new people and cultures. She loves to cook and find out about new wines. Her favorite sports are skiing, volleyball, bicycling and hiking. She also enjoys water sports, especially jet skiing. Dr. Lazar grew up in Fairfax County, graduated from Robinson High School in 1987, and received his BA in biology at the University of Virginia in 1991. He earned a Doctor of Veterinary Medicine degree in 1996 from the Virginia-Maryland Regional College of Veterinary Medicine. In 1997, he completed a one-year rotating internship in small animal medicine and surgery at the Animal Medical Center in New York City. Following a year of private practice in Manhattan, Dr. Lazar moved to Maitland, Florida, and spent four years in a small animal surgery internship and residency at Affiliated Veterinary Specialists. In 2003, he earned board certification by the American College of Veterinary Surgeons. 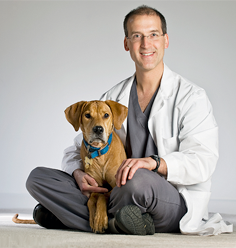 Since 2002, Dr. Lazar has focused on small animal specialty surgery in Northern Virginia. He lives in Reston with his wife, two sons and a plethora of pets including dogs, cats, birds, snakes and fish. Our principle sonographer, Mark B. Taylor, MA, DVM, has been performing echocardiograms and abdominal ultrasounds since 1998. For a period of time, Dr. Taylor worked with New Jersey Mobile Ultrasound/Sound Technologies (a division of VCA/Antech) in northern NJ and Staten Island, NY and was a mobile sonographer in SE Florida for many years. Dr. Taylor received his BS from University of Kansas in Systematics and Ecology and went to complete a MA in Botany (physiological plant ecology). He then switched gears to animals and received his doctorate in veterinary medicine at Kansas State University. Nutrition is also an interest and passion for Dr. Taylor, having completed a residency in clinical nutrition from Virginia Maryland Regional College of Veterinary Medicine and NC State University. Dr. Taylor is currently a Resident in Radiology and Diagnostic Imaging through VitalRads in Houston Texas! Diffuse osteopenia and myelopathy in a puppy fed a diet composed of an organic premix and raw ground beef. Taylor MB, Geiger DA, Saker KE, Larson MM. J Am Vet Med Assoc. 2009 Apr 15;234(8):1041-8.